ATLANTA (AP) — A federal judge said forcing Georgia to scrap its electronic voting machines in favor of paper ballots for the upcoming midterm elections is too risky. But she said state elections officials had “buried their heads in the sand” and warned them not to delay in tackling concerns about the security of the machines and its elections system. U.S. District Judge Amy Totenberg’s Monday ruling means the state won’t have to use paper ballots for this year’s midterm elections, including a high-profile gubernatorial contest between the state’s top elections official, Republican Secretary of State Brian Kemp, and Democrat Stacey Abrams, a former state House minority leader who’s trying to become the country’s first black, female governor. Totenberg said the voting rights advocates who sought the change to paper ballots have demonstrated “the threat of real harms to their constitutional interests,” but that she worried about the “massive scrambling” required for a last-minute change to paper ballots. Early voting starts Oct. 15 for the Nov. 6 midterm elections. David Becker, executive director of the Center for Election and Innovation Research, said the judge did the best she could given the circumstances. “While it would have been an invitation to chaos to change Georgia’s voting system this close to an election, the court also signaled that plaintiffs have a strong claim, and that the state will have to move to an auditable, paper-based system very soon, without further delay,” he wrote in an email. Voting integrity advocates had sued state and county election officials, arguing that the touchscreen voting machines Georgia has used since 2002 are vulnerable to hacking and provide no way to confirm that votes have been recorded correctly because there’s no paper trail. They sought an immediate change to paper ballots for the midterm elections while the case is pending. Coalition for Good Governance executive director Marilyn Marks and David Cross, a lawyer who represents a small group of voters, said that even though the judge declined their paper ballots request they were encouraged by the tone of her ruling. Both said they’re reviewing the decision to decide whether to appeal. Meanwhile, lawyers for the state Tuesday filed a notice that they intend to appeal Totenberg’s denial of their request to dismiss the case entirely. The case is being watched closely because Georgia is among five states, along with more than 300 counties in eight other states, that exclusively use touchscreen voting machines that provide no paper record, according to Verified Voting, a nonprofit group focused on ensuring the accuracy of elections. About one in five U.S. voters cast ballots in 2016 on electronic machines that lack a human-readable, auditable paper ballot and Lawrence Norden of the Brennan Center for Justice at New York University Law School says that number won’t have changed by November’s election. The judge noted a general consensus among cybersecurity experts and federal officials about the insecurity of electronic voting machines with no paper record, specifically pointing to a Sept. 6 report from the National Academy of Sciences report that says all elections should be conducted with “human-readable paper ballots” by 2020 with every effort made to use them in this year’s general election. Kemp, who rejected federal offers of assistance with election system security in 2016, has conceded that the current machines should be replaced. He established a commission earlier this year to look into a change and last month called for proposals to implement a system with voter-verifiable paper records in time for the 2020 presidential election. 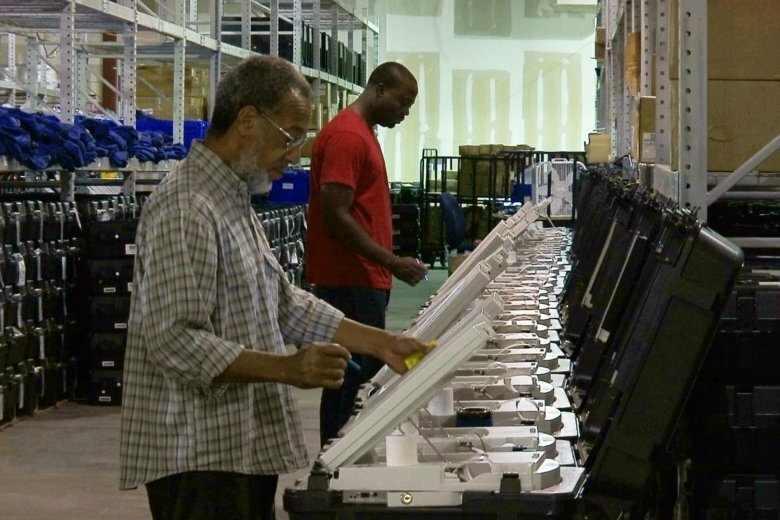 But he and other election officials argued the machines are still secure and a last-minute change would be costly and cause chaos. In addition to worries about the machines, Totenberg said the state did not seriously address the impact of a breach of a state election server in its arguments. Security experts last year disclosed a gaping hole that exposed personal data for 6.7 million Georgia voters, as well as passwords used by county officials to access election-staging files. That hole still wasn’t fixed six months after it was first reported to election authorities. Kemp’s office blamed the Center for Elections Systems at Kennesaw State University that managed the system. But ultimately, it reported to his office. Associated Press cybersecurity writer Frank Bajak in Boston contributed to this report.